Beef stock (water, concentrated beef stock), maltodextrin, salt, sugar, yeast extract, onion powder, beef extract, beef fat, natural flavour, dimethylpolysiloxane. 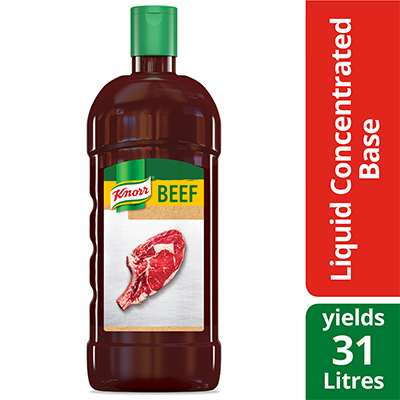 Add rich flavour and aroma to your menu items while minimizing kitchen prep time with Knorr Professional Liquid Concentrated Beef Base. Designed by chefs for chefs, this liquid concentrate offers a faster, more flavourful alternative to paste bases. The soup mix instantly dissolves when added to boiling water, creating a delicious, aromatic beef broth. Use it as beef soup stock for a hearty stew, or as a starting point for a beef-based sauce. Ideal for restaurants, catering services, and other fast-paced kitchen environments, this beef bouillon base brings premium quality and outstanding efficiency to any culinary establishment.